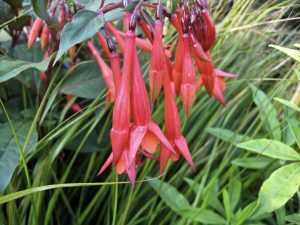 Not the hardiest Fuchsia but by all means one of the showiest. This improved form of ‘Gartenmeister’ is taller with longer brilliant orange red flowers. Tubular pendant flowers in groups to 3″ long. They appear in a massive and continuous display for months petering out around frost. To 30″ tall and very upright- just half as wide. The foliage is a distinct maroon/burgundy which sets off the hot colored flowers nicely. Rich, well drained soil with regular summer irrigation. Part shade to full sun (but not against a hot wall) with water. Incorporate a handful of all organic fertilizer at planting. To over winter this more tender than normal beauty plant deeply, mulch in autumn heavily, and even pile some dry leaves around the crown. It may return from the base if we have a mild winter (above 20ºF). Otherwise its a stellar container constituent. Hummingbirds.